- Finished size : 3000x600x27mm with Laminated Knotty-Pine Solid Timber Staves - ( Un-wrapped Boards ). The timber is a knotty pine redwood with quite large knots, and is untreated. Recent batches have been manufactured from a lower grade of timber than we have been used to seeing - the timber staves may have knots missing, resin pockets which leave an open recess when the resin has seeped out ( and sharp edges around the recess if the stave is machined in that place ), burrs in the timber which in effect are like a large irregular misshaped knot and waney edges on some staves which leave the adjoining staves proud with a sharp corner edge. Most of these faults are found on one face ( so far ) - The best description of the quality is "Rustic" Economy-Grade, but then the price is cheaper than a true A/B grade board. 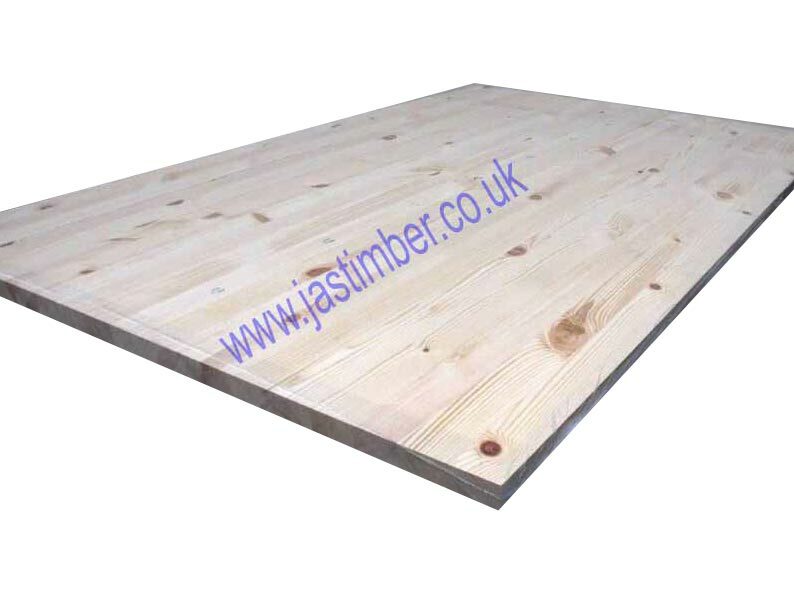 Unwrapped Pine Jointed 27mm Furniture Board - Economy Grade Redwood "Contract Quality"
The current 27mm Pine Board is square-edged, and has mainly 45mm to 48mm wide staves. The timber is a knotty pine redwood with quite large knots, and is untreated. Recent batches have been manufactured from a lower grade of timber than we have been used to seeing - the timber staves may have knots missing, resin pockets which leave an open recess when the resin has seeped out (and sharp edges around the recess if the stave is machined in that place), burrs in the timber which ineffect are like a large irregular misshaped knot and waney edges on some staves which leave the adjoining staves proud with a sharp corner edge. Most of these faults are found on one face (so far) - The best description of the quality is "Rustic", but then the price is cheaper than a true A/B grade board. The specification allows solid or engineered Pine finger-jointed timber staves 40mm to 60mm wide by 40mm thick, although at present staves are solid pine, and mainly 45mm to 48mm wide, and are finger-jointed at 300mm to 600mm lengths, and may be untrimmed at the ends of the board. The knot size is quite big in this Rustic Grade Pine - see photos; The timber is untreated. Not suitable for use as doors without suitable framing or bracing - twisting & cupping can occur if pine boards are not fixed in place. For internal domestic use, in dry areas. The key to a long lifespan for your Pine Jointed Board is plenty of timber treatment, You need to give 5 or 6 six coats of a Danish Oil or Microporous Stain treatment to both faces, all edges, and any cut-outs. Pine Boards need to be fixed in place before any movement starts to occur in the timber; The Boards need to be fixed firmly enough to stop any cupping or twisting the is prevalent in boards that are as wide as this. the treatment for your Pine Boards needs to be maintained - sanding down and another 2 coats per year is recommended. "Contract Quality" means that this Engineered Timber is sold as a Solid-Pine Jointed-Board, ideal for use as Pine Furniture, Pine Desktops, Pine Worktops, Pine Shelving and Pine Solid Panelling, where the Pine Jointed-Board can be fixed solidly in place, and used in a normal domestic environment, in a dry area. - We cannot be held responsible for any variations in machined 27mm Pine Board sizes, pattern, grading, moisture content, treatment, certi­fica­tion, knots, colour or grain. - We cannot exchange any Timber Product once work has commenced; Non stock Pine Board and Direct Deliveries are supplied as a Special Order. 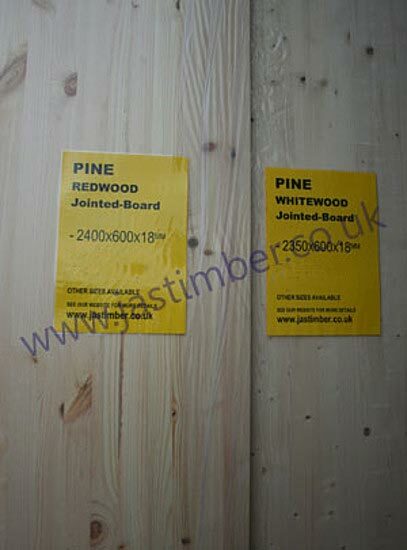 Payment - We can take Debit Card, BACS, Cash, Cheque or Credit Card payment online for Pine Jointed Board. E. & O.E. see T&C - We do try to keep prices and specifi­cations of 630mm Redwood Furniture Board correct, but mistakes can be made!